I've had my feet on the ground for two weeks which is very unusual for me. I've been spending lots of time getting class prep done for my upcoming engagement with the Narragansett Bay Quilters in Coventry, RI and then for my 5-day engagement with Quilting Adventures in New Braunfels, TX. There are SO many hours of prep time here at home preparing for engagements abroad... I need to look halfway professional and organized when I get there! I had a full week on the school fundraiser quilt and also managed to set aside quilting time from 4-6 am working on the star quilt. 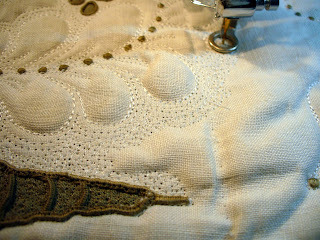 I have reached a full halfway point and am finally starting to be happy with how it is looking. I often say that my quilts go thru "puberty" before they become full fledged adults. They are awkward and gangly and have lots of awkward moments. 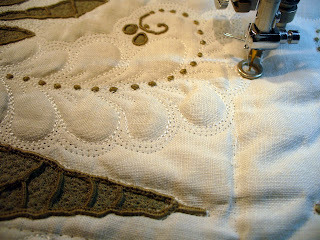 I have to be VERY patient with this part of the process so I don't ditch the entire quilt. 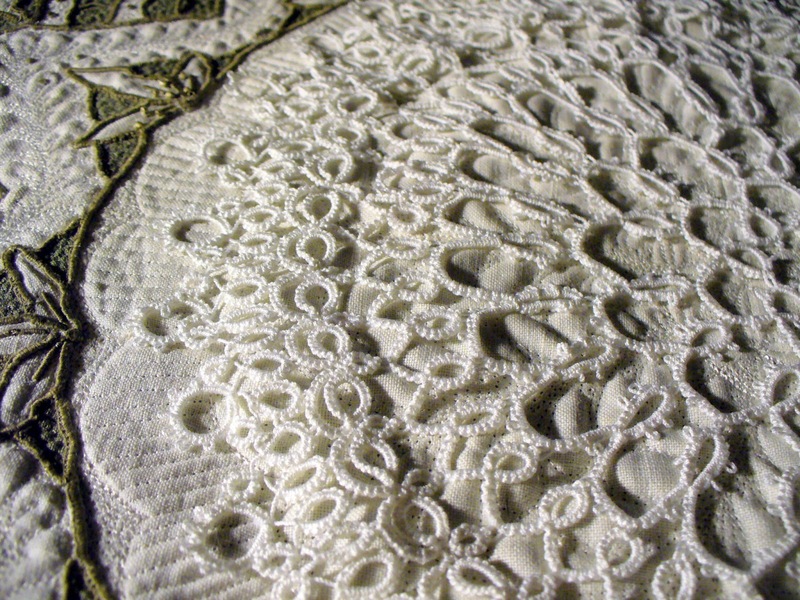 I finally found just the right tatted doily for the center. The original linen is very dynamic with a strong design and it needs an equally strong design in the middle to support it. 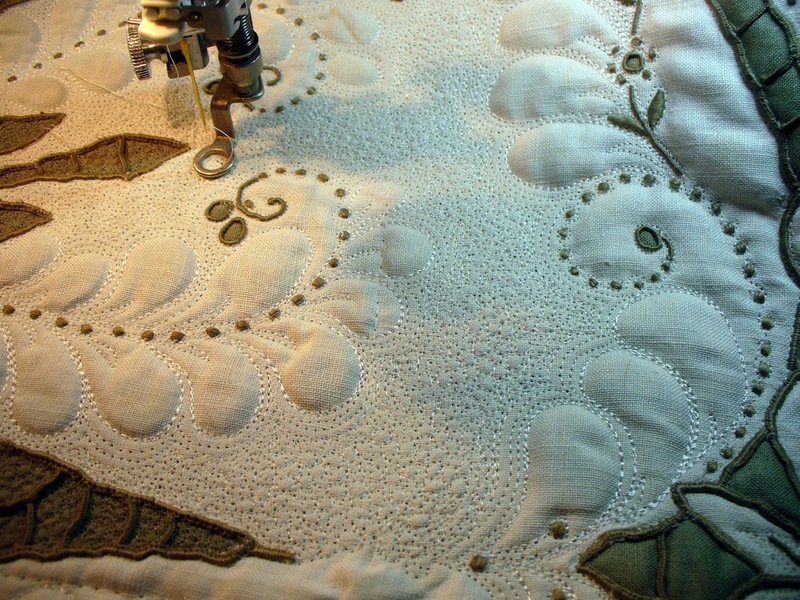 "Normal" quilting won't do. 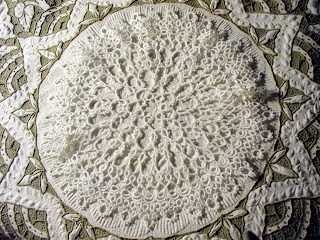 I did quilt a feathered fan design in the middle to stabilize it and placed the tatted doily over the top. 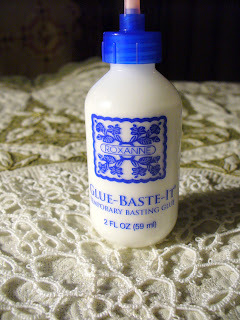 In order to secure this for heavy beading and embellishing, I used Roxanne's Temporary Basting Glue. 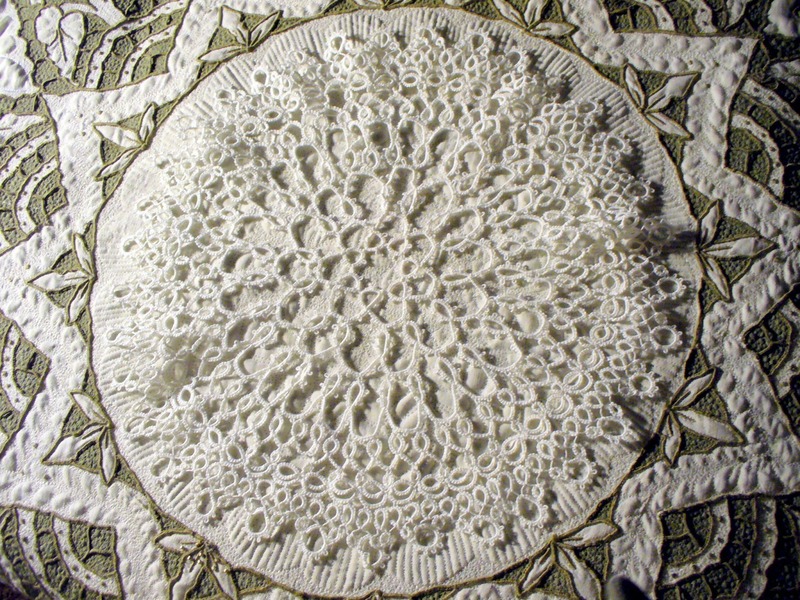 I placed very small dots under the tatting in strategic areas to adhere it to the quilt center. Now I can pack this around with me on my upcoming travels and add beads, etc. without it shifting. I went thru my button bucket last night and pulled some buttons and jewelry that will be assembled in the middle to create a beautiful center medallion. 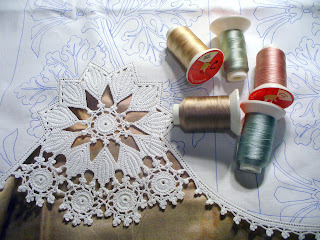 Lots of beads and pearls will be added to the tatting to dress this up a bit. I'm also having fun with the background texture for this piece. 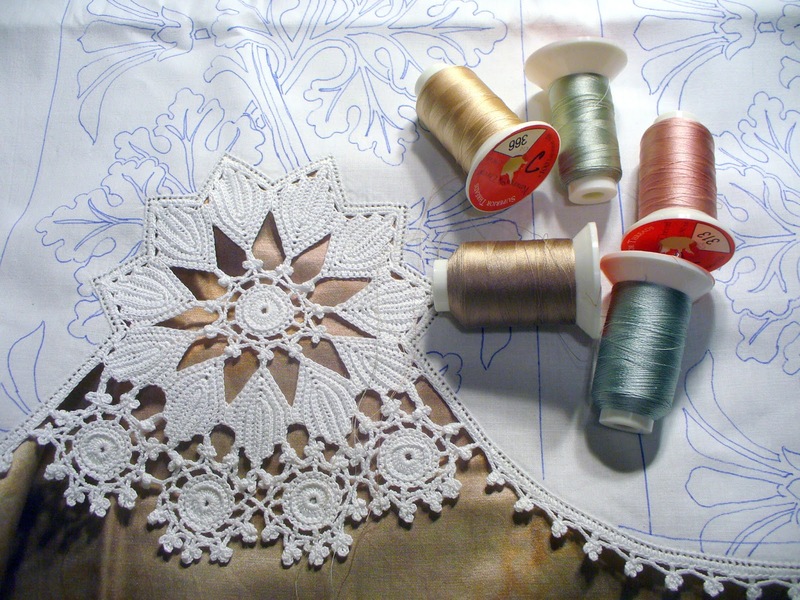 I mentioned in my previous blog how much I was enjoying the new Magnifico thread by Superior Threads. I started the feathering on this quilt with Superior's Highlights...I went back and requilted the feathers with Magnifico so that my stitches were more full. I am echoing all the primary feathers three times with the Kimono Silk. ...and then fill in the remaining space with very small bubbles. 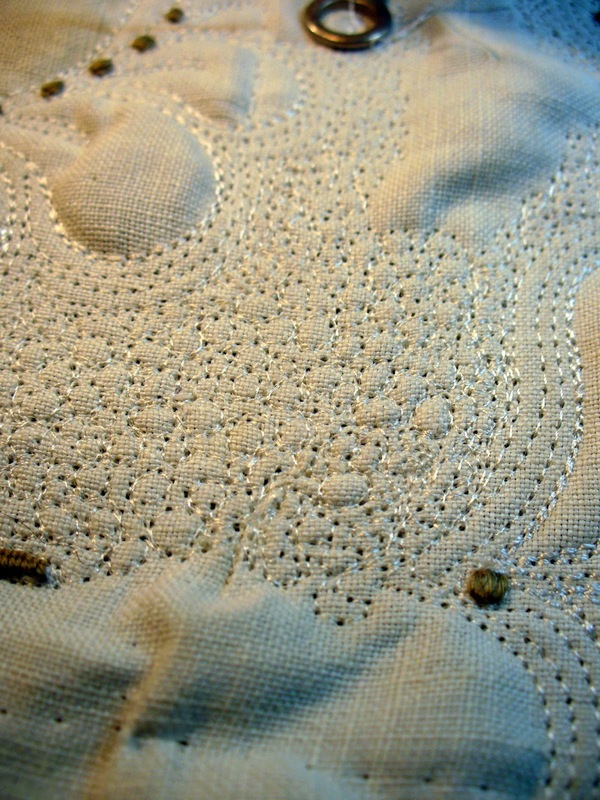 The silk dives right into the fabric and all you see is the beautiful texture that is created. It is very tight and firm right next to the feathers but has a lighter texture in the middle....you see it and then you don't...very cool! 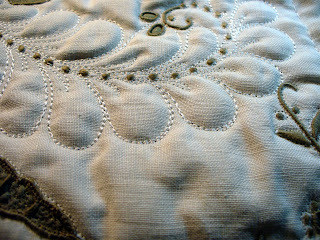 I also have the beautiful pillowcase that was gifted to me by Vicki ready to rock and roll in the machine. 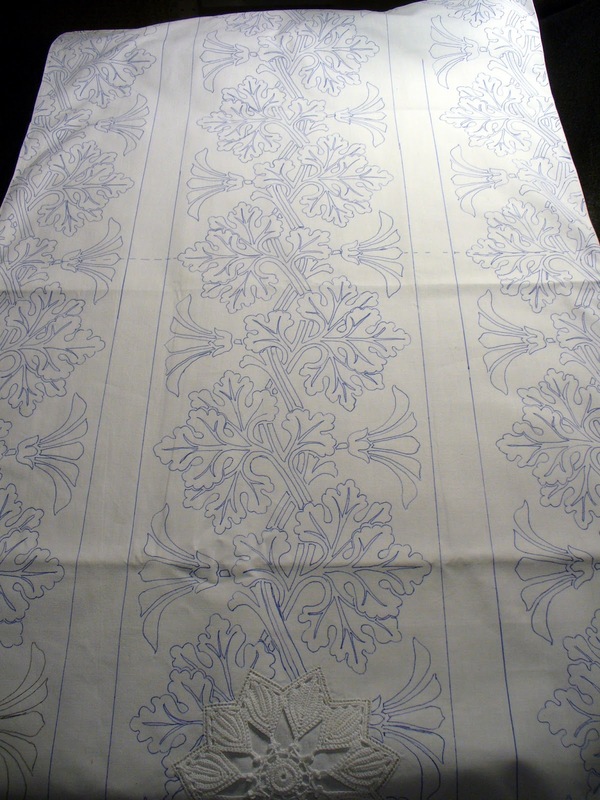 I marked the full Morning Glory design straight down the middle and then marked half of it on either side. 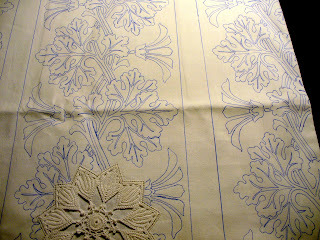 I will run some sort of a linear border down either side of the middle for a division. 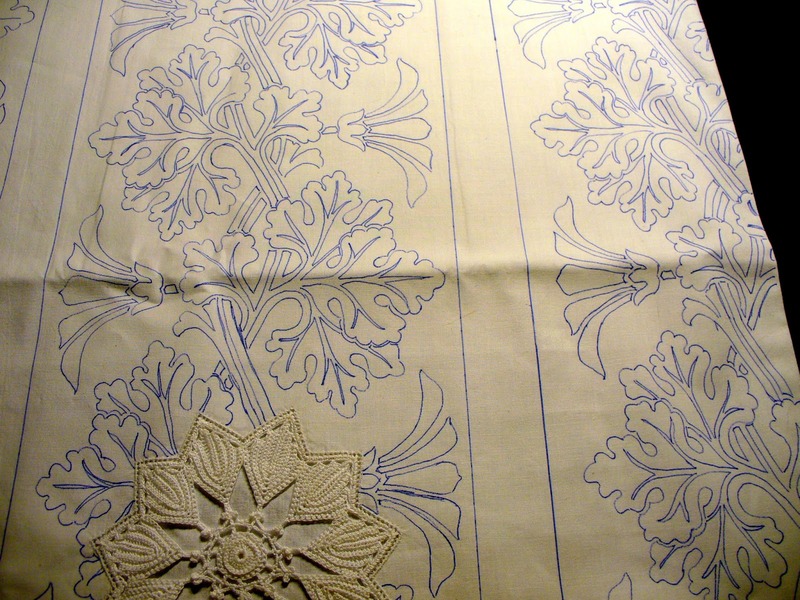 I was gifted some beautiful hand-dyed Radiance by my friend Marti and this will be the fabric that is placed underneath the crocheted work to show it off. 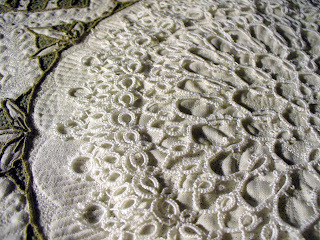 Kimono Silk will be used for all the quilting. I really love your work - it's fabulous! You will never be a slacker. Lovely piece. And, I do appreciate hearing your insight on the basting glue. I've been hesitant on using glue, but recently started investigating. 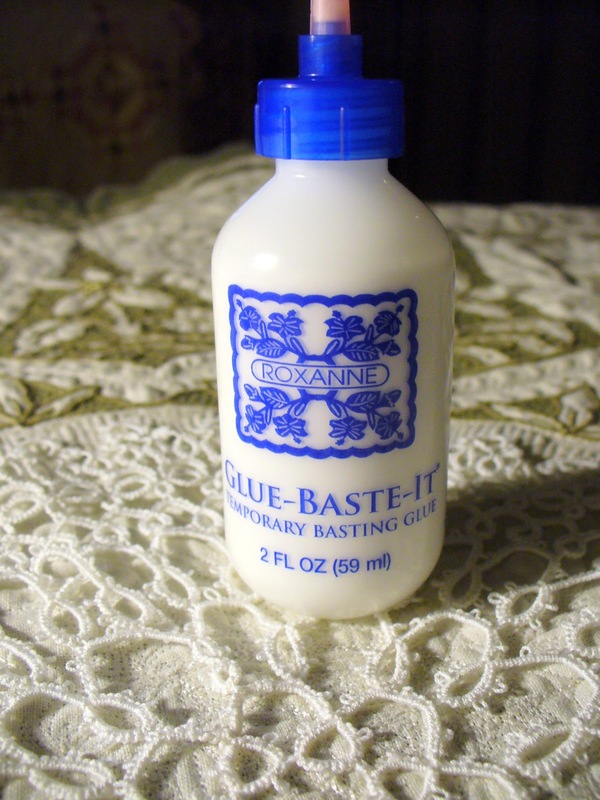 If you use it for your beautiful linen quilts, I'm confident this has got to be a great product and I look forward to using it. Thank you! Are you kidding me? After a horrible weekend working "full court press" in a trauma hospital trying to do my part to help patients experiencing the worst of the worst, I was done with all of it! After work I came home and locked myself in, away from all the horrible things that happen to good (and bad) people to sulk about the state of the world. I absolutely LOVE that tatted piece. It actually gives me goosebumps.